We are passionate about seat overhaul service at Dretloh Aircraft Supply Inc. The inspection part of the overhaul process is crucial. At Dretloh, we utilize the I.R.A.N (Inspect and Repair As Necessary) method so that we meet your needs with services exactly where you need them. During the inspection phase, a mechanic may find a part that is still functioning and does not appear to be broken. The mechanic may be prompted to replace the part. In these instances, the mechanic is following the requirements set by the manufacturer and overhaul limits. These manufacturer limits force replacement because the part may not make it to the next overhaul period. When considering modifications, upgrades, or improvements to existing standards, we offer our clients a variety of options. These options include full seat overhaul service of aircraft seat: cushions, dress covers, plastics, structural parts, hardware replacement, as well as in-flight entertainment or IFE solutions. IFE upgrades include the latest standards in technology. Upgrades to tech on an aircraft include monitor screens, power supplies, USD and power outlets. Anything related to electrical such as harnesses and new fairings is regularly manufactured and installed according to the installation kit. Furthermore, we supply portable or in seat solutions for aircraft providing in-flight entertainment and connectivity or IFEC. In the case that our client orders these services, we take care of everything. From the initial system evaluation to the execution of services, we provide recommendations on certification, integration, and installation. In addition, we have the capability to modify 9g and 16g seats to meet specific needs and layout of passenger accommodation or LOPA requirements. We are certified to repair all seat makes and models from yesteryear to today. A few of the suppliers we’ve worked with are Avio, Sicma, and Zodiac, although this list frequently changes. Please inquire directly to learn about current suppliers. In accordance with the Federal Aviation Administration (FAA) and the European Aviation Safety Agency (EASA), we can provide documentation as needed. These include: Flammability Test Reports (TPR), completed issuance documentation of Dual Release 8130-3 tag, and Dual Release 8110-3. We are proud to offer our expertise in reconfigurations. These generally involve aircraft interior components and seating adjustments for all commercial aircraft. We are qualified to develop improvements to both coach and business class seating requests. Improvements and engineering drawings for completed projects always follow FAA and EASA requirements. In addition, our complete designs, engineering, and certification services are customized to meet every client’s needs. We work with broad scope maintenance programs, seat rotations, and lease returns. 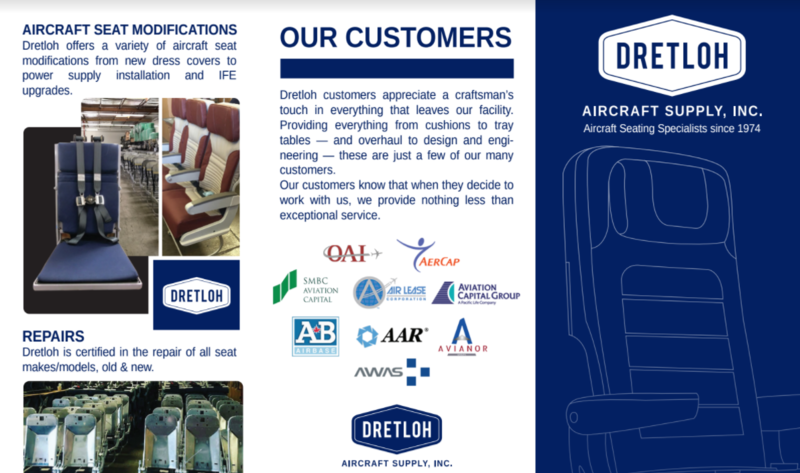 Due to our outstanding reputation, we are confident that you will be satisfied with our aircraft seat repair, overhaul, and refurbishment here at Dretloh. If you are looking for seat overhaul service make sure you contact us today.